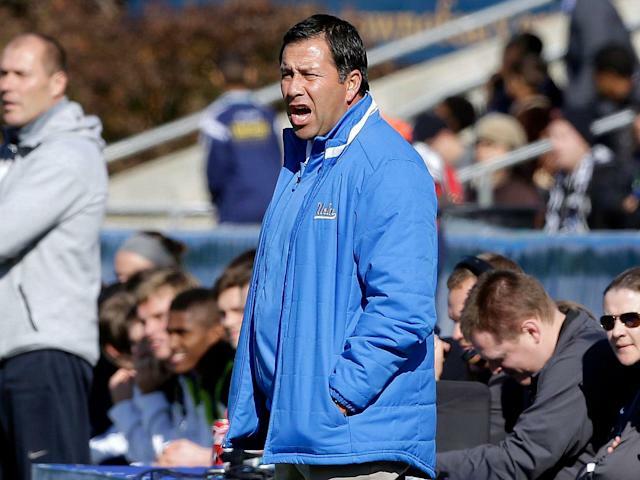 UCLA men’s soccer coach Jorge Salcedo has resigned after being indicted for allegedly taking $200,000 in bribes in the college admissions scandal. The university confirmed Salcedo’s departure with the Los Angeles Times on Thursday. The school placed Salcedo on leave last week for allegedly helping two students enroll at UCLA as soccer players despite not playing the sport. He’s facing charges of conspiracy to commit racketeering as part of a wide-sweeping federal crackdown on an alleged scheme allowing wealthy parents to pay the way for their children’s college admissions. Salcedo is one of nine college coaches in various sports at schools across the country accused of being involved in the scandal that made news when Hollywood actors Lori Loughlin and Felicity Huffman were charged with paying bribes to ringleader William Rick Singer. Singer pleaded guilty on Tuesday last week to charges of racketeering, money laundering, obstruction of justice and conspiracy to defraud the United States. The Times reports that Lauren Isackson, a student at UCLA, was listed as a member of the 2017 women’s soccer team despite never having played competitively. Singer allegedly paid Salcedo $100,000 and provided a fake athlete profile at the behest of Isackson’s parents, according to the report. The Times cites court documents accusing Salcedo of accepting another $100,000 from Singer in 2018 to help an unnamed male student gain admission under the guise of being a soccer player. Salcedo was a student and soccer player at UCLA from 1990-93 and was the head men’s soccer coach for the Bruins since 2004. He compiled a 182-89-42 record at UCLA with six conference championships and 14 appearances in the NCAA tournament.